I fell in love with tourmaline the first time I saw it. I saw gemmy tourmaline at shows and sales and marveled at the colors and the way it handled light. 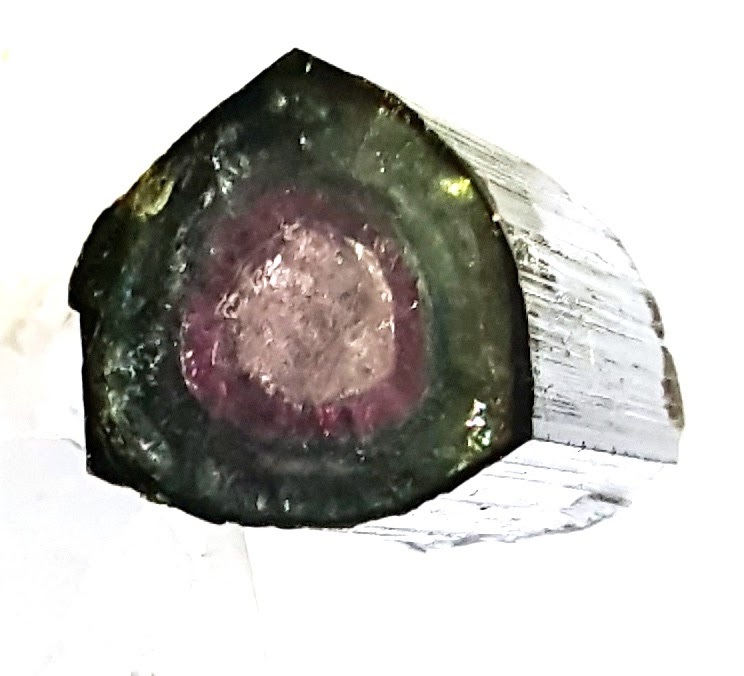 I bought the Watermelon Tourmaline above from another collector. The face is only three-quarters of an inch across, but if you're looking at it on a computer screen and it looks huge, well, that's the way I see it. I love watching the light shine through the deep rose red and green. 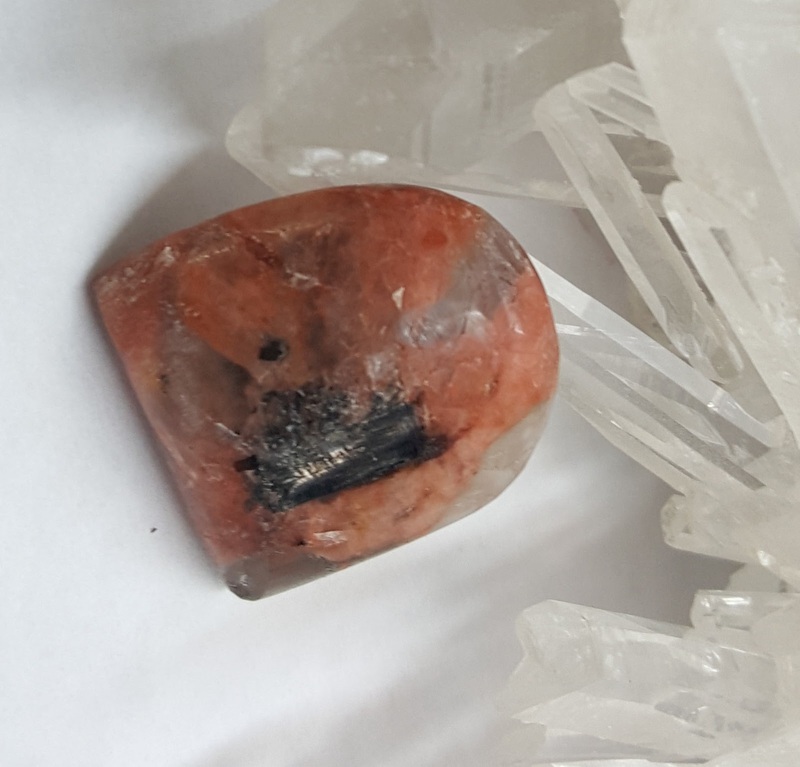 I'll never cab this piece, in part, because I'd hate to lose it as a specimen, and in part because when I look at it closely, I see lines that make me think it's been fractured before and might not hold together on a grinder. 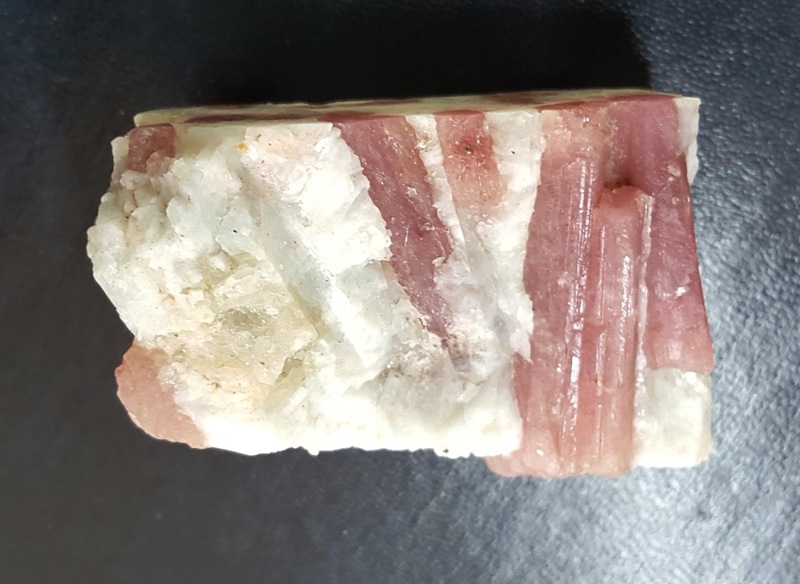 This pink specimen is in my case. It's not very gemmy, but when I hold it I can clearly see the crystal structure in the white matrix and that's why I had to bring it home with me. in matrix that wasn't gemmy at all, but had personalities that tickled my cabbing bone. 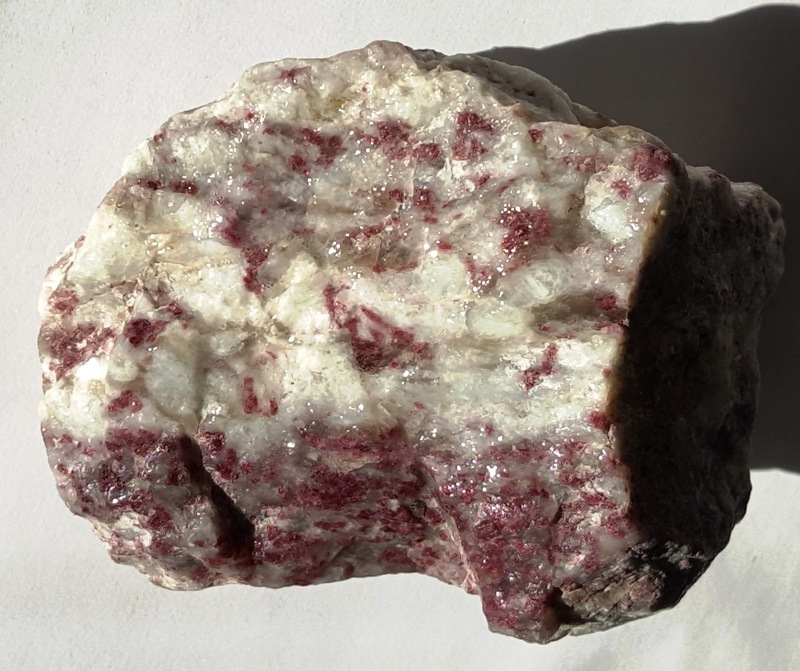 This rock and the next are fairly friable, which added challenges to the cabbing process. I was delighted that this material cabbed without any stabilizing support. However, since it was somewhat smooshed (a technical term (?) for crushed over and over until it was a conglomerate), there were no clearly defined edges. The finished cab took a nice polish and I love the way it looks. It's sweet and romantic and reminds me of violets. 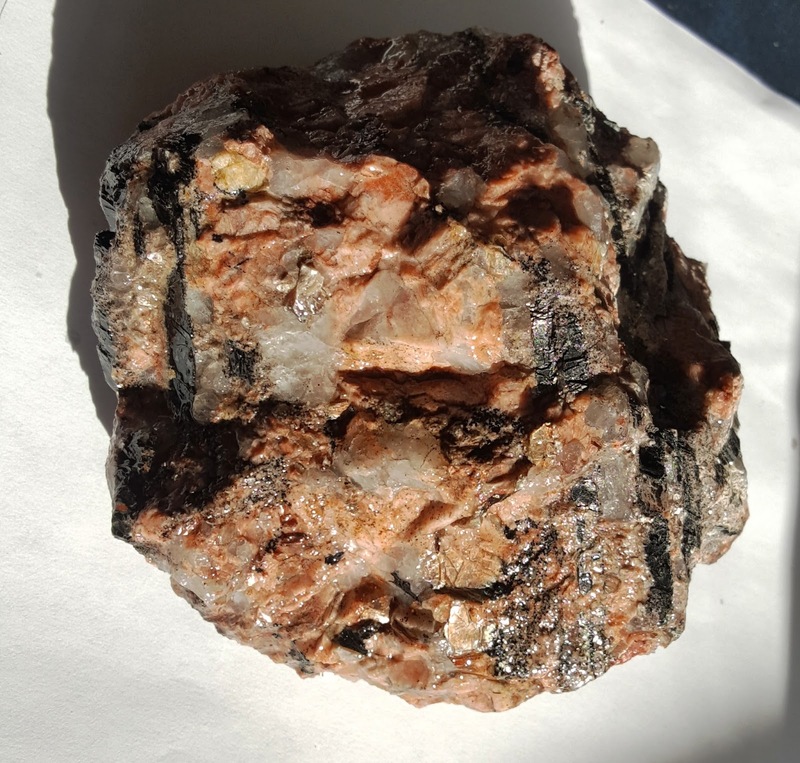 I purchased this conglomerate rock, because it had black tourmaline, quartz, and mica on a rhodo matrix. This picture shows the colors as pretty muddy. It also tells the story of the fractured character of the specimen. A quick run through a saw, told me how friable it was. DA-DIDDA-DA!!! I took some slices and treated them with Opticon. 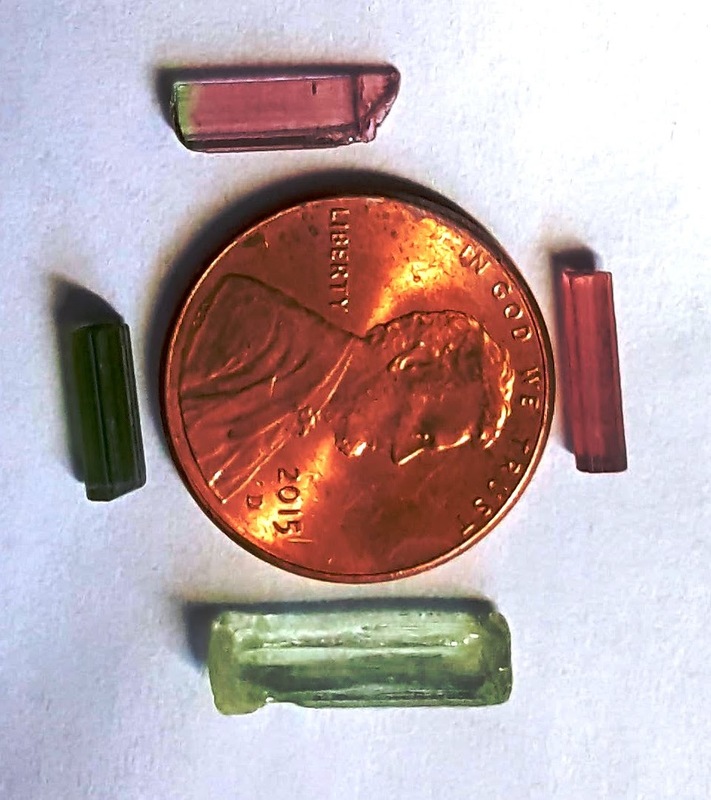 Then they held up to my Genie and I was able to work them into cabochons. The pink rhodo looks a whole lot better after it's been polished than it did in the original rock. 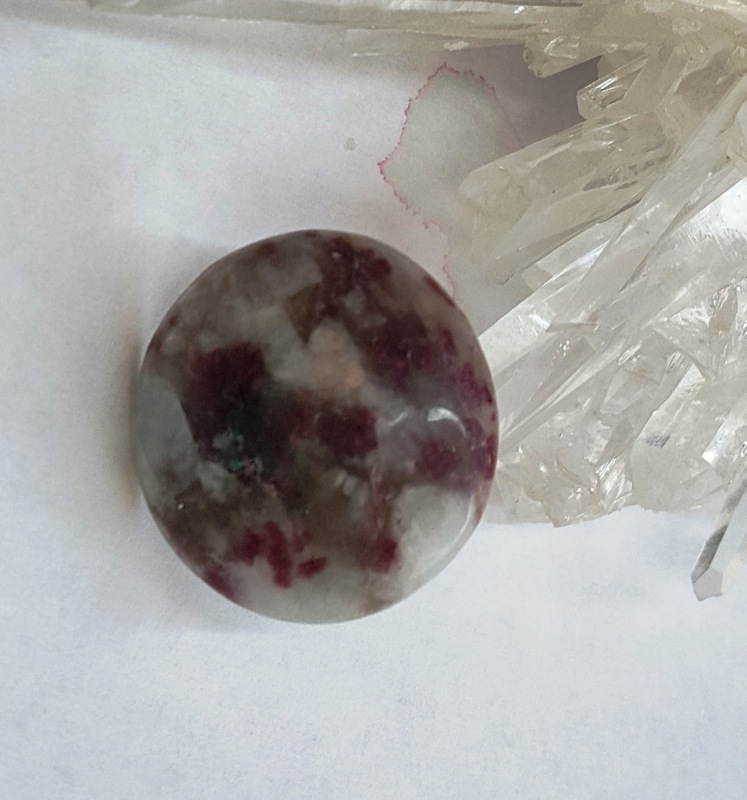 In this image you can also see the clear quartz and smooshed black tourmalite. 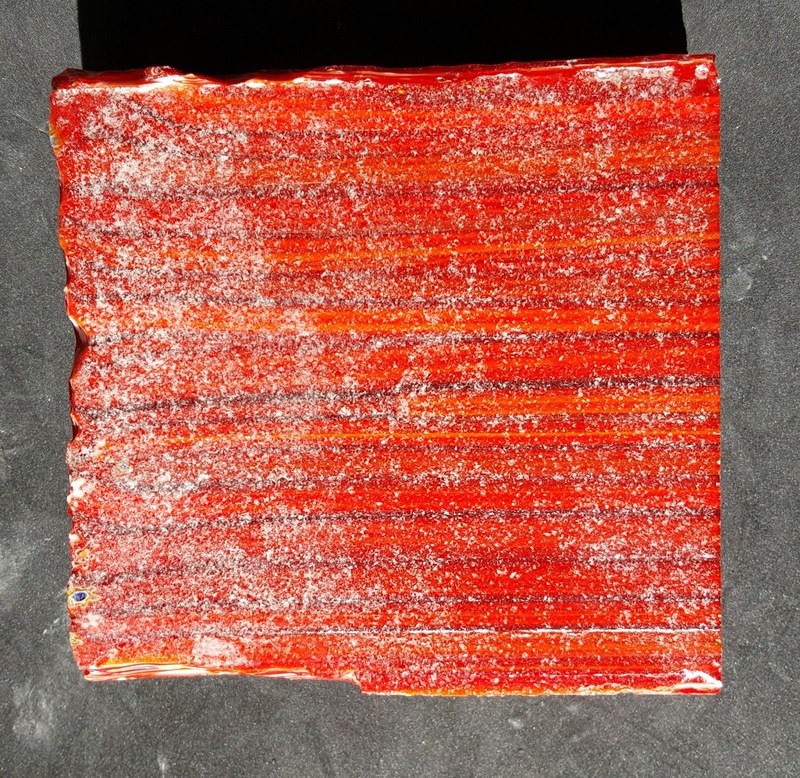 In my last post, I offered this slab of millefioria-style glass to the person who sent me the best name for it. The responses were wonderful! Two of my favorites were "Montana Wildfires" and "Swept Up to Heaven". The winner was the one who made me laugh. Vic McPherson named it "Oozite" because of the way the columns seem to be trying to ooze out of the slab. Vic, it's on its way to you! I hope you enjoyed my post. I love reading your comments! 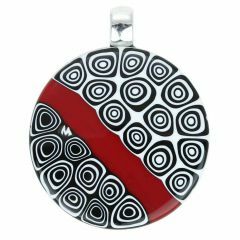 I've always admired the Millefiori Glass when I've seen it in beads and pendants. The bright colors and patterns that remind me of the late 1960's (Flower Power anyone?) and were pretty tempting. I also love kaleidoscopes, and the Millefiori glass I'd seen looked somewhat like it was at the end of my kaleidoscope. I'd tried a few times to get my hands on some, but until my trip to Arizona this month, I hadn't had any luck. Then I saw it in a tub in Quartzsite! Bricks of the stuff! The reds, the blues, and the green were spectacular. The tiny flowers would bring a smile to Grinch's face. So I bought some and brought it home. I love this stuff so much I have to share it. If you want a FREE SLAB, see below! GLASS BRICKS--THE ANSWER TO THE PROBLEM OF GETTING DIFFERENT ANGLES. 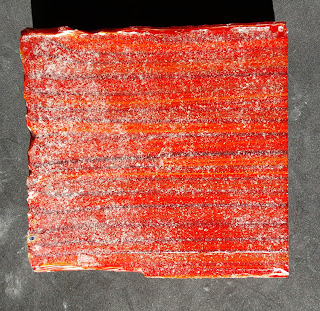 This red brick is about six inches square and about 1.5 inches thick (see the end cut above). There is some sort of silvery material around the brick, probably glass dust. Notice how the parallel lines on the side gave me a lot of new possibilities! The reason I wanted bricks instead of slabs was because I was fascinated with the possibilities of cutting and cabbing it that weren't just a strait cut parallel to the blossoms. I wanted to do cabs, and I wanted to cab the glass on angles showing off the material inside. This is a piece I cabbed from the green block I purchased. The colors are bright and it almost looks like there's some weird choir singing through the glass. In my haste to acquire these beautiful bricks at such a good price, I didn't ask too many questions. I'm sure none of you have ever done that . . . The good price? Well, the show was a few days from closing, so I figured I got lucky. Maybe. After I got home, I gave myself some time to take a better look at the bricks. They were still beautiful, but, darn if there weren't some flaws. 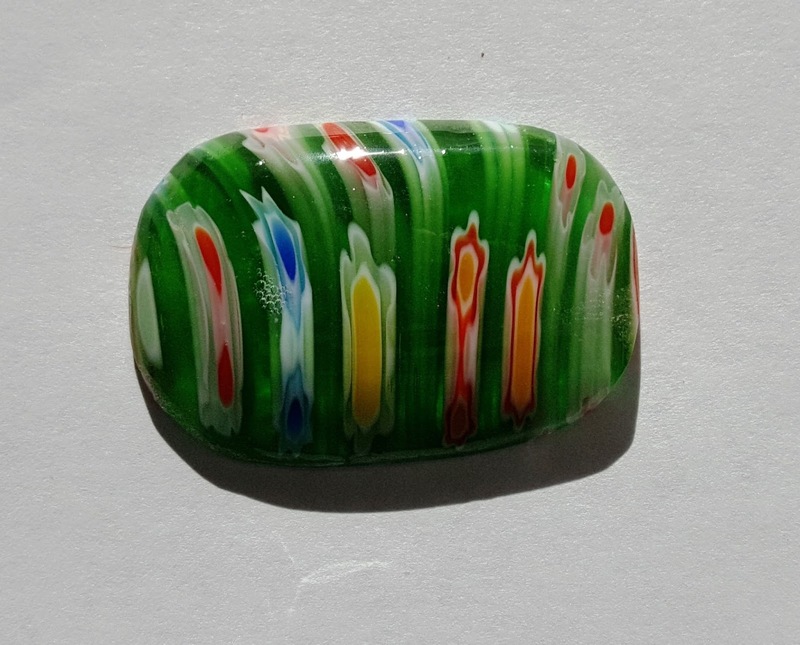 But even world famous Millefiori Glass from Murano would occasionally have a bum batch they'd sell off cheap, right? Because of the history and craftsmanship of the Millefiori Glass made in Murano, Italy. It is the gold standard. Other places may make a similar looking product and even use the same techniques, but they aren't the same. Many are undoubtedly lovely, but it's similar is using the word "Champagne" to describe a bubbly wine. While there are many wineries that produce extraordinary bubbly all around the world, only wines made from grapes grown in the Champagne area of France and grown and produced following specific guidelines are actually Champagne. WHAT MAKES MILLEFIORI GLASS, MILLEFIORI GLASS? 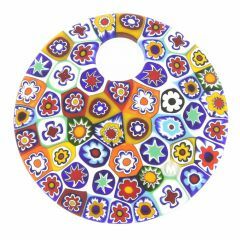 According to Wikipedia, "Millefiori is a glasswork technique which produces distinctive decorative patterns on glassware. The term millefiori is a combination of the Italian words "mille" (thousand) and "fiori" (flowers). Apsley Pellatt in his book Curiosities of Glass Making was the first to use the term "millefiori", which appeared in the Oxford English Dictionary in 1849. The beads were before then called mosaic beads." 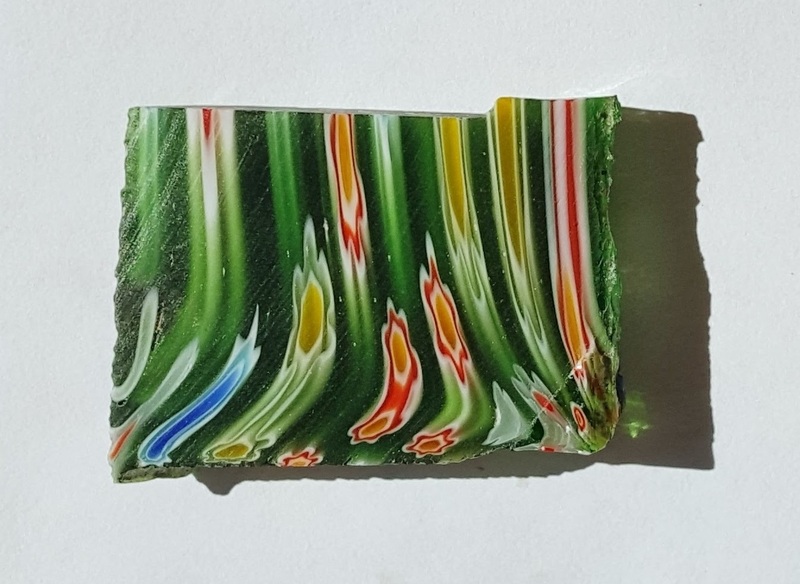 Murano masters typically do not sell Millefiori Glass in bricks, Italian Millefiori Glass is available either in rods or in the finished form. 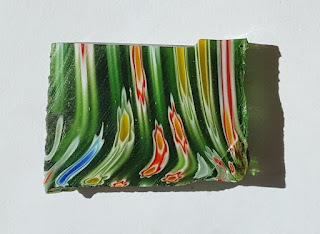 Murano Millefiori is entirely handmade using the ancient method, which is very labor intensive and results in high prices." I checked the website and you have to purchase a whole lot of the stuff to get that price. 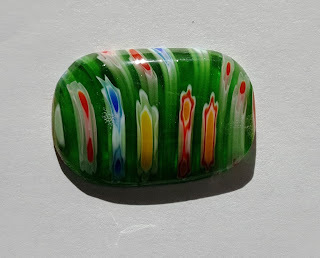 Also, checking around, I discovered that the Murano glass is generally sold in rods or bits of rods, to be assembled, fired, and finished by the glass artist. On their web site, Glass of Venice, they share this history of the beautiful glass. "In the sixteenth century some of the Murano (Italy) glass artisans started attempts to imitate the beautiful ancient glassware created by Romans. 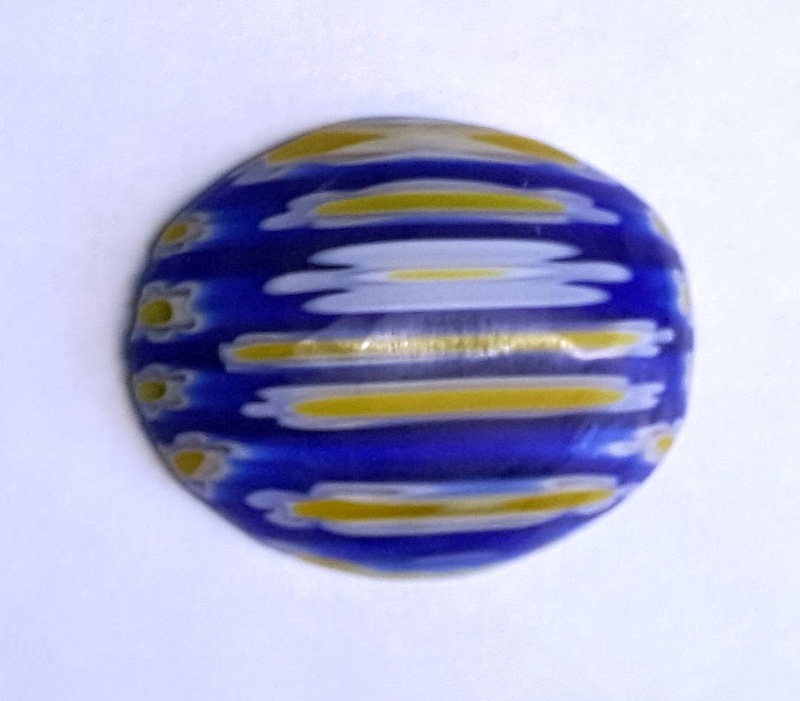 They were successful in doing that, but as with many other glassmaking techniques, the secret they uncovered had subsequently been lost again until the interest in these Roman pieces sparked anew in the second half of the nineteenth century. At that time when archeological discoveries became more frequent and many beautiful decorative items were unearthed, Murano glass artists again became fascinated with glassware from classic antiquity created by the ancient Romans and exhibited in the famous Murano Glass Museum. Some of the beautiful objects that came to us from those times include glass vases, bowls, urns, and plates with flower or abstract patterns spread around the inside and outside surfaces of the objects. You might think I'd be disappointed to know that the millefiori-style glass I purchased wasn't the real deal, but you'd be mistaken. I think the parts with flaws, make the viewer wonder 'what happened there?' which is another way of creating a story. The parts that don't have flaws? That's a story of its own. I'm going to keep working with it from time to time and see what other stories it has to share. As you know, this Lapidary Whisperer, has rocks that tell her their stories which I try to incorporate into whatever I make of them. So, I'll send this slab to the reader in the U.S. who gives me the name or story for this stone I like best. If you work it, I'd love to run a picture of what you made on a blog in the future. If you just like the slab, no problem. The story doesn't need to be more than a sentence or so, just let me know what you see in it. The slab has angled sides. The even, flat part is roughly 1.25 x 1.25 x .25 inches.